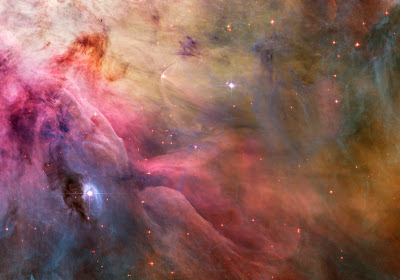 The color mosaic of the Orion Nebula and nearby star-forming region. Credit: NASA, ESA, M. Robberto (Space telescope Science Institute) and the Hubble Space Telescope Orion Treasury Project Team. Carbon, hydrogen, oxygen and other atoms knock about in nebulas, sometimes freely and sometimes bound up with ice and dust. They arrange themselves into elaborate molecular structures. Meteorites abound with organic compounds, which rain down on any nearby planets. We know that meteorites contain amino acids and even nucleobases, but not whether they scooped up those molecules from dust clouds or created them later, on their interplanetary course. “We really don’t know where the chemistry in the dust cloud stops and where the chemistry in meteorites starts up,” Weaver says. She notes that the answer has tremendous implications for one of science’s most fundamental questions: How common is life throughout the universe? Read the full article in Discover.